We can agree or disagree about many things in our country’s history, but the effect of Benazir Bhutto on our nation is indisputable. 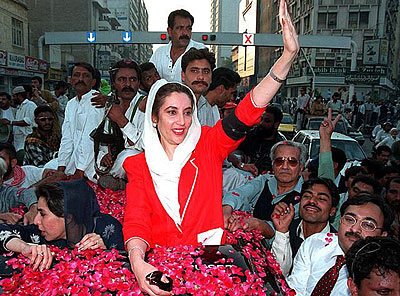 From her unexpected rise to power to her tragic assassination, Benazir Bhutto changed the path of our country. In many ways, she put the country back on track after Gen Zia sent us wildly off course. As first woman PM, she showed half the country that they are also important parts of society and can reach the highest points of power. However it was her courage and vision that touched the hearts of even her strongest critics. “In 1988, at the age of 35, Bhutto became the youngest prime minister in Pakistan’s troubled history, and the first woman to lead a Muslim nation in the modern age. For her supporters, she stood for women’s empowerment, human rights and mass education. Her detractors accused her of many things, from corruption to being too close to the U.S.
During her second tenure as prime minister, Pakistan became one of the 10 emerging capital markets of the world. The World Health Organization praised government efforts in the field of health. Rampant narcotics problems were tackled and several drug barons arrested. Bhutto increased government spending on education and 46,000 new schools were built. Today, she is gone from this Earth in body but her courage and vision has stayed in this country and is found in other those such as Mukhtar Mai, Malala, and countless other women who refuse to cower in the face of threats. Her vision for a modern Pakistan can even be found in the political slogans of her former opponents such as when Nawaz Sharif promised to turn Pakistan into a new, modern and developed country. When Pakistan’s enemies killed her, they ended her life, but they underestimated her once again. Benazir Bhutto was more than a person, she was a force of history and her spirit will always outlive her enemies. This entry was posted in Blogs and tagged benazir bhutto by Omar Derawal. Bookmark the permalink.